I went to the dentist earlier this week. I’ve only been to this office once, but I like the people, they’re friendly. Having taken the children to a dentist in a nearby town and getting my oldest into an orthodontist up near St. Louis I’ve come to the conclusion that people in and around the dental profession are some of the friendliest, sweetest-natured professionals in the world. I’m told they have to be because so many people hate dentists. But that’s not what I want to talk about today. While laid back in the dentist’s chair, waiting for him to return to finish the work he’d begun on my teeth, the hygienist and I made small talk; weather, gardening, kids. Mostly only interesting because half my mouth was numb. The context of our conversation was irrelevant, benign really. At some point she interjected something about the sermon she’d heard in church Sunday, about how we are to love each other in spite of our failings, how we are accountable to God and not to men. This has stuck with me. More and more often these things stand out to me. It occurs to me that people outside the Bible Belt might really have no clue how public religion has become. It is not a personal thing anymore, if it ever was. In Smalltown Midwest America faith in God and involvement in church is the rule, not the exception. It is assumed that you are one of them. Yes, one of them; us and them. I cannot see it differently. I immediately feel like an outsider when someone starts talking about their faith, like I’m some kind of spy, an undercover agent. If this person knew they were talking to an atheist… I wonder what would happen if I were to be found out? Should I reveal myself before they say anything more to incriminate themselves? But what if I don’t want to announce my unbelief to the world? As it is, it takes effort to push this glaring difference aside and remember that this is just another human being in front of me with whom I might have all kinds of different and amazing things in common. Humanity; focus on the humanity. But isn't it interesting that no one stops to ask if their conversation partner is a believer? I guess they just assume we are or hope that something they say will intrigue us if we’re not. It occurred again today. Seth and Blue went in for their first dental check-up/cleaning. The hygienist and I chatted about the weather, the children, laundry, gardening, my dental care. When she found out which practice I use she raved about what a wonderful doctor and staff they were and punctuated this with the statement: "You know, they pray every morning before they begin their day’s work." I was supposed to be impressed. She didn’t ask me whether I believed in the power of prayer. I smiled and didn’t comment and wondered what I could or should say. I wondered this all the way home. That’s interesting. I don’t personally believe in the power of prayer. I used to, but I’m an atheist now. I could have told her about my first book, written about my first year post-bible, a copy of which I happened to have with me. Part of me wishes I’d spoken up. I almost feel deceitful not saying anything (am I ashamed of who I am?) but another part of me insists I don’t need to go there. What would be the point? I needn’t broadcast my unbelief to anyone. However, I was yet again suddenly thrust into the position of Unintentionally Undercover Atheist. If I didn’t make myself known, was I merely cementing her assumption that I shared her delusion? What I wish I’d said: “That sounds interesting. I’m personally very skeptical of such stories and happen to be a former christian turned atheist who doesn’t believe in an afterlife.” It could have turned into a conversation about how such anecdotal evidence is not true evidence. Some days I just don’t feel up to engagement. It’s been one of those weeks for me, to be honest; worse than my occasional withdrawn mood. Feeling very much like I would just like to crawl in a hole and take a break from the world. Rather, I'd like to work in the garden with absolutely no distractions for a week. The social demands upon this introvert have been high and I’m drained, but it doesn’t stop my mind from engaging. The encounter from earlier in the week joined this one in my brain for a good workout, running laps and jumping jacks; mental fitness during the forty-five minute drive home. Does it bother me that religious people are often outspoken? No. I don’t mind people sharing their passions. It does get under my skin a little bit now because I see christianity as a huge lie, but even that doesn’t bother me too much as religion is simply, apparently, part of the human experience. The presumption that I am a believer or, at the very least, interested gets to me bit more; a person wouldn’t just start in talking about golf assuming I knew about golf or was interested. Why not ask before diving in? But this is a cultural thing and I suppose some allowance should be made for it. No, what begins to gnaw at me is that I am put in the position of being an atheist, undercover or otherwise. There would be no atheists if there were not theists. Because theism defines the majority of people around me, by default I find myself an atheist, a label I would otherwise not burden myself with. I did not go out into the world this week to share with anyone about my unbelief in God. I don’t feel the need to spread atheism wherever I go (though I am interested in teaching skepticism and critical thinking, reason and logic). I don’t feel the need to engage with every christian who brings up God or Jesus or the bible. So what is an unintentionally undercover atheist to do? I was content to discuss the gorgeous spring weather, swap gardening tips and enthusiasm, connect with other parents about the interesting children in our lives or, imagine, just get some freakin’ dental work done on myself and the children without the staff referencing their imaginary friends. And I think this is why I don’t speak up sometimes. Fighting the division, trying to focus on the humanity, on the commonality. But, I am an atheist. And as I think about it, I guess I’m an atheist not only because others are theists, but because I once was a theist myself. Atheism exists because theism exists, generally, but this is part of my character now. Part of me. I do believe that, however it started and why-ever it continues, belief in the bible god is some sort of delusion. And I saw the wizard behind the curtain. I cannot unsee it. I have been down that road. With hard work and a pinch of chance my journey has been forever altered. As a christian, I would not have taken kindly to being called delusional. Or ignorant, but I think ignorant is the most appropriate word. And for the most part there is no “sin” in ignorance. Looking around me now and thinking back to my own past, I think there are some who are willfully ignorant, some who are not, and some mixture. It just does not occur to some to question things. Some refuse to question past a certain point. Some question and feel they have found answers, but don’t understand about the scientific method, about evidence, about peer review, about logic and reason. I fell into the latter category. I now understand the work involved in flushing out truth. Ignorance does not equal innocence and is not an acceptable condition to remain in. An awful lot of damage can be done by the ignorant. I daresay that’s when most of the damage is done. Christianity, any bible-based religion, has done its share. There are consequences to ignorant thought and behavior. I’ve written about some of those before. So, I am torn, always. I often hold back in random engagements as described above then unload in writing. So, am I an outspoken atheist? I guess I’ll accept the title, since I wrote a book largely about that. But, like I said, I don’t feel the need to spread atheism wherever I go. I will occasionally counter christianity when I meet it. I will attempt to do so in a thoughtful fashion. I do not aim to provoke and I do not aim to convert. I am hungry for reason. I am thirsty for mobs of critical-thinking humans who can begin to make necessary changes to our culture and our world. A friend suggested to me this evening that people need the idea of God. Not that he believed God existed, but that the idea of God exists and it exists for a reason. I admit to believing that the God idea, in its many variations, came directly out of humanity’s attempts to understand itself. As my friend seemed to be explaining, humanity needs to believe in God to explain the great unexplainable fortunes and calamities of life. I personally don’t feel the need for this in my life. I truly don’t. I've had it, now it’s gone, and I feel my life is much richer without it, more focused. Denny feels this way, also. I know many others who do not feel the need for God, but I know many who do. I know some who reject the bible god, but embrace the idea of a higher power. It looks to me like they desire what mankind has always desired: a reason for life’s mysteries. Without getting into my thoughts on the “God of the Gaps” (expounded upon in my book, “Free to Be.” Today’s mysteries are tomorrow’s knowledge), I see humanity giving God credit for its good accomplishments, accepting blame and condemnation from God for our failings, and believing that all we have do to do is ask forgiveness and he will make everything better. It’s an astounding system, a perfect system designed by a humanity that doesn’t know what to do with itself or doesn’t want to bother. Personally, I would rather wipe away all the religion, all the ideas of higher power, and get down to bare humanity. We will look our accomplishments in the eye and own them. We will look our “sins” in the eye and own them. We will look around us and ask, “What can we do differently? What steps can we take to improve ourselves,” instead of waiting for God to perfect us. We will offer each other the best that we have, physically and emotionally; all that energy we used to pour into worship of God, prayer, bible study, church-building and missions. I think only then will we be able to heal our communities, save ourselves, save our planet and fellow species. It will only happen when we accept who and what we are and stop looking to God for answers. When we stop leaning on the crutch of God and stand on our own damned feet. One more thing happened today to ‘cause me to stand up a little straighter and look my culture in the eye, unashamed of my non-theism, unashamed of my humanity. I donated one of my books to my local library. I’d also had some book-promo bookmarks made up and had left a stack of them with my librarian who set them on the counter with the usual library bookmarks. A homeschool mom friend writes christian romance novels and I remembered that she had done the same a couple years ago with her bookmarks and that they had prominently displayed her book with a placard declaring “Local Author.” My librarian friend informed me that a religious patron took my entire stack of bookmarks to “show her minister.” Stole the whole stack. My friend wasn’t present at the time, but learned this from another librarian who happens to be a christian. She suggested to him that he might want to reconsider promoting my book. I was also told that a new employee, a young christian, saw my book on the shelf (awaiting processing and Dewey Decimal assignment) and scoffed at it. So, returning to the list of things that bother me about my recent interactions, it burns me a great deal knowing that if I were to speak as freely about my atheism as christians do about their theism, I would be met with considerable ugliness and be seen as antagonistic and divisive. The playing field is not level. The idea that my book could not be as freely promoted by my local library as a christian romance novel rather raises my ire. I do not ask special treatment, but equal treatment. In the asking of such I will likely be viewed as a militant atheist. I will be calling the library headquarters next week to see if they have a policy regarding promoting local authors. I will avoid discussing the subject matter of my book and go from there. I will also be talking to them about setting up a book signing/reading at my local branch. From there I will see about getting my book into some stores in the area (there’s only one book store in my town and it’s christian. Hmm). I think I’m ready. I, like everyone I know, am just a human being trying to find my way. I will be met with opposition because my journey is against the grain of my immediate culture, but I will stand tall, unashamed of my experiences and who I am, and I will do my best to connect with my fellow humans. I'm originally from the US, and lived in the south (Virginia), but that's certainly not the deep south, so it's not as bad as many parts of the bible belt. I know Missouri, as well, since my father is from there. Ah, Patrick from Goodreads Patrick! I just now noticed I had some comments awaiting moderation here. =) Thank you for your thoughts. I would love love love to travel around the world or even just in the US to get a feel for religion outside the Bible belt. It's so strange to me to be right in the thick of it now. Just found your blog today and have enjoyed reading your posts! I'm a former fundamentalist baptist somewhere in the process of probably becoming an athiest (more of an agnostic at the moment). I would love to read this book that you speak of writing but couldn't find the title (it's possible that I missed it). Would you mind sharing that? Best of luck on your journey to becoming who you are apart from religion! Hi there! Welcome to my blog. Have some pretzels and mint lemonade on the house. =) Congratulations on working your way out of religion. It's not for the faint of heart, so I already know you're a brave soul. Keep up the good work. You're not alone! 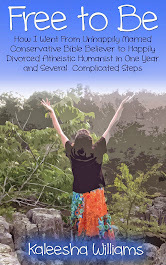 My book, if you haven't encountered it yet, can be found at Amazon: http://www.amazon.com/Free-Unhappily-Conservative-Atheistic-Complicated-ebook/dp/B00IZ0Y1XY/ref=sr_1_1?ie=UTF8&qid=1404173620&sr=8-1&keywords=kaleesha Or you can purchase an autographed copy from KaleeshaWilliams.com. There's a link on the sidebar. Thanks for stopping by!